The Best Olde World Market in Town! Burrini’s is always looking for new ways to advertise. One of their favorite methods is to use their large window space in the front of their building and we are always happy to help! We have done many jobs over the yeas at Burrinis. 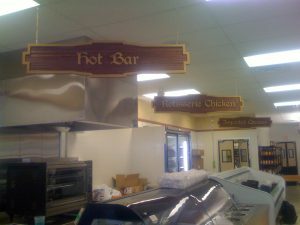 From wrapping refrigerator, custom carved ceiling signs, window lettering, dimensional lettering, window signs, banners, and sidewalk signs. You can find them at 1204 Sussex Turnpike in Randolph NJ 07869.